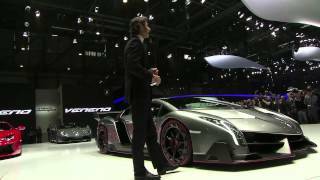 Lamborghini has unveiled the Veneno Roadster which is the most exceptional super sports cars of all time. Only nine units will be built and will carry a price tag of 3.3 million Euros. 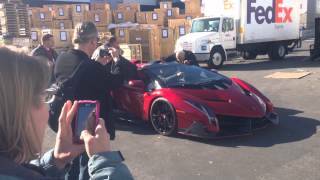 The Lamborghini Veneno Roadster has no roof, just a strong rollover bar for optimum safety. The design is focused on optimum aerodynamics and stability through fast corners. A monocoque made from carbon-fiber reinforced polymer forms the basis of the Roadster. All exterior parts are made from CFRP. Carbon fiber dominates also the interior of the Veneno Roadster. The carbon fiber monocoque is visible inside the car around the central tunnel and the sills. The two lightweight bucket seats are made from Lamborghini's patented Forged Composite. 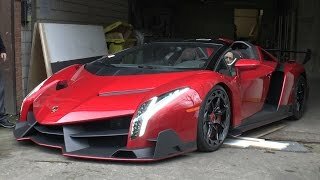 The Lamborghini Veneno Roadster is driven by a twelve-cylinder engine with a displacement of 6.5 liters and is equipped with the extremely fast-shifting ISR transmission with five modes, permanent all-wheel drive and a racing chassis. It will produce a maximum output of 552 kW / 750 hp. The Veneno Roadster accelerates from 0 to 100 km/h in just 2.9 seconds and top speed stands at 355 km/h.